The Kauffman Center for the Performing Arts is passionate about providing youth in our community opportunities to experience high quality performing arts, learn about the facility, and even plan for a future in the arts. Please sign up at the bottom of the page to join our educators email list and be informed of upcoming opportunities during the school year. Students arrive for a school matinee at the Kauffman Center. Photo by Cody Boston. The Kauffman Center is proud to present a wide-range range of matinee experiences for students throughout the school year. All school matinee tickets are $2 each, and ticket applications are required. All matinees for the 2018-2019 school year are complete. We will update this page soon with more information about 2019-2020 Kauffman Center school matinees! Teachers: More details on each Kauffman Center school matinee can be found below. Contact opendoors@kauffmancenter.org to receive the free National Geographic Live school matinee study guide containing more background on the presenters, details on visiting the Kauffman Center, and a wide-range of classroom resources. School matinees are eligible for bus transportation assistance through our Open Doors program. Transportation assistance applications and more information can be found here. Orders will be processed as they are received and confirmation emails with invoices will be sent to the teacher within 2-3 weeks. Teachers are then responsible for sending relevant details to administrators to begin payment process. Each year, there will be over twenty school matinee performances, and they are listed under the Student Matinee page of our website. At this time, all student matinee performances qualify for the Open Doors Transportation Assistance program. Please be aware that only groups with more than 20 students who are traveling by bus are invited to apply. Also, transportation assistance applications must be submitted at least five business days prior to the scheduled performance. What if my group reserves tickets to a Kauffman Center Presents school matinee, but we need to cancel at a later date? If your approved group needs to cancel a National Geographic Live student matinee reservation, please let the Kauffman Center know as early as possible by sending a notification to opendoors@kauffmancenter.org. Tickets must be paid for in full no later than one month prior to the performance date. Any school that cancels beyond that deadline will not receive a refund. Wednesday, October 10, 2018 – 10 a.m. & 11:30 a.m.
Tuesday, October 16, 2018 – 10 a.m. & 11:30 a.m.
Wednesday, October 17, 2018 – 10 a.m. & 11:30 a.m.
Tuesday, November 6, 2018 – 10 a.m. & 11:30 a.m.
Join the Kansas City Symphony as we discover the similarities between authors and composers. How do composers create story elements like character, setting and plot? How do authors create intriguing plots that keep the reader wanting more? Through exciting music and the 7th annual Writing Challenge, we’ll explore all of this and more! Kansas City Symphony Young People’s Concerts are designed to spark the imagination of students in grades 3-6. Programs include an introduction to the orchestra while making connections to the English/Language Arts curriculum. Tuesday, February 12, 2019 – 10 a.m. & 11:30 a.m.
Tuesday, February 19, 2019 – 10 a.m. & 11:30 a.m.
Wednesday, February 20, 2019 – 10 a.m. & 11:30 a.m.
Thursday, February 21, 2019 – 10 a.m. & 11:30 a.m.
Wednesday, April 3, 2019 – 10 a.m. & 11:30 a.m.
Thursday, April 4, 2019 – 10 a.m. & 11:30 a.m.
Monday, April 29, 2019 – 10 a.m. & 11:30 a.m.
Tuesday, April 30, 2019 – 10 a.m. & 11:30 a.m.
By any definition, music moves. Melody, rhythm, and harmony all change, shift, and develop. When an orchestra plays for us, we may notice more than one kind of movement. On the outside, we can hear sounds move as the musicians change their pitches, rhythms, and dynamics. We can see the musicians’ bodies move as they play. On the inside, we may feel our emotions moving and changing in response to the music we hear. Sometimes music might even create a sense of physical movement as sounds become heavier or lighter, rise up or tumble down. Through the Link Up repertoire, hands-on activities, and a culminating interactive performance with the Kansas City Symphony, we will discover how the orchestra moves. Each student ticket includes a student workbook. Teachers may also opt to purchase student tickets that also include a recorder. One teacher per school will receive Carnegie Hall’s Teacher’s Guide, recorder, KCS Teacher Training Workshop and access to Carnegie Hall’s online teacher resource center. Friday, September 14, 2018 – 10 a.m.
Friday, October 5, 2018 – 10 a.m.
Friday, January 11, 2019 – 10 a.m.
Friday, January 25, 2019 – 10 a.m.
Friday, February 8, 2019 – 10 a.m.
Friday, March 8, 2019 – 10 a.m.
Friday, April 12, 2019 – 10 a.m.
Friday, May 31, 2019 – 10 a.m. Select Kansas City Symphony dress rehearsals are open to middle school, high school, and college music students. This program offers a unique look inside the rehearsal of a professional symphony orchestra and may include a brief Q&A with the guest artist, conductor and/or Symphony musicians. Thursday, October 18, 2018 – 10:30 a.m. The much anticipated world premiere by Septime Webre, the creator of Alice (in wonderland), will take audiences on a fantastical journey to the Emerald City. Filled with all the familiarity of the classic movie – Dorothy and Toto swept to Oz join up with three unlikely heroes to see the Wizard, their triumph over the Wicked Witch, and the quest to return home – yet realized with a bold, new spectacle of music, costumes, sets, projections and special effects. Friday, November 30, 2018 – 10:30 a.m.
Thursday, December 6, 2018 – 10:30 a.m.
Friday, December 14, 2018 – 10:30 a.m.
Bring your students to Kansas City Ballet Artistic Director Devon Carney’s production of this favorite holiday classic. Carney created a traditional, adventurous and re-imagined production. A two-act ballet based on E.T.A. Hoffman’s story— featuring vibrant costumes, elaborate scenery, and stunning sets, this classic tale tells the timeless story of Clara, the Mouse King and her Nutcracker Prince. Thursday, September 20, 2018 – 6 p.m. When the only family you’ve ever known is a gang, and the only home you’ve ever had is a small patch of turf, anyone from anywhere else is an outsider. It’s here on the West Side, springing from a crack in the sidewalk and surrounded by despair, that the greatest love story ever retold blooms—and burns. When opposites inevitably attract, and when the unlikely new couple tries to reconcile their worlds, the more their dream of finding a place of their own is torn apart. And from the first cigarette to the final “te adoro,” watching is such sweet sorrow. With the original symphonic score, and Jerome Robbins’s original choreography adding a kick of kinetic eye candy, tonight truly won’t be just any night. Sung in English with English subtitles. Thursday, November 1, 2018 – 6 p.m. Wrapped in rapturous musical beauty that will bring you to tears is a heartbreaking ending that will bring you to your knees. We can only watch as Butterfly floats toward her fate, like a moth to a flame, like a lamb to the slaughter. ‘Til death do them part. Sung in Italian with English subtitles. Thursday, March 14, 2019 – 6 p.m.
With a name that practically screams “master manipulator,” the cynical Don Alfonso goads two friends into making a not-so-friendly wager. Its outcome will either defend the virtue of the two sisters they love, or expose a duplicitous streak supposedly inherent in all women. Unknown to their brides-to-be, a battle of the sexes has begun, and the two men set out to test the faithfulness of their fiancées, but end up tempting Fate in the process. In the midst of madcap machismo and pre-feminist farce, we find Mozart in Monte Carlo, sipping mojitos, reveling in the mischief, and leaving the rest of us to marvel at his musical masterpiece. Sung in Italian with English subtitles. Chosen as one of the Top 10 Performances of the Decade for Kansas City, Störling Dance Theater’s UNDERGROUND is a powerful and inspiring portrayal of the Underground Railroad movement and the abolition of slavery. All teachers attending will receive a copy of the nationally award-winning Underground Curriculum Guide that meets Missouri and Kansas State Educational Standards in the areas of Language Arts and Social Studies. 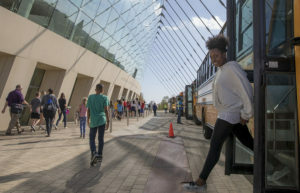 The Kauffman Center Open Doors Spotlight on Youth program offers a wide range of experiences for students to learn from staff and utilize the facility’s resources. Find out more about each of the available experiences below. Learn about how the Kauffman Center staff runs one of the country’s premiere performing arts centers. Students can learn more about the daily operations and professional departments (e.g. marketing, programming, fundraising, theater production, and more!) These staff Q&A sessions last between 30 – 60 minutes and are often paired with a 45 minute facility tour. Scheduling is based on staff availability, and the Kauffman Center typically hosts no more than one Career Center Stage a month. Fees will be paid for through the Open Doors program if the group is affiliated with non-profit organization (must provide Tax ID number). To get more information about this program or inquire about availability, please contact the Community Outreach Supervisor at opendoors@kauffmancenter.org or 816-994-7227. As part of our Open Doors Spotlight on Youth program, students can participate in a special backstage experience. Students will engage in hands-on-activities, tours, and discussions with some Kauffman Center production staff members. This unique experience is designed to introduce high school and/or college students to careers in technical theatre including lighting, sound, carpentry, or venue management. Participants will be amazed by all the work that happens backstage to create a successful production! Scheduling is based on staff and facility availability, and the Kauffman Center staff typically hosts no more than one Backstage Intensive a quarter. Fees will be paid for through the Open Doors program if the group is affiliated with a non-profit organization (must provide Tax ID number). Children’s Tours provide an in-depth look at the facility’s architectural highlights while giving young people the opportunity to explore the Kauffman Center’s performance spaces. Participants will learn about the Kauffman Center’s history and will take part in a discussion about the artistic details throughout the facility. Children’s Tours are available for a $100 flat fee for groups of up to 60 students, and payment in full must be made in advance. Be among the first to learn about educational opportunities at the Kauffman Center for the Performing Arts by signing up for our Education Email List. By opting in to this education email list, you will receive information about Kauffman Center educational programs as well as performances that will be presented at the Kauffman Center.